U.S. EPA Administrator Scott Pruitt moved this week from questioning people's role in climate change to suggesting that it could be positive for humanity, a claim that scientists described as wrong in interviews yesterday. It's a shift in rhetoric for Pruitt, who tends to choose his language carefully and who often sticks to prepared talking points in public interviews. Scientists say his latest interpretation is a severe misrepresentation of climate research, which shows that rising temperatures could deeply alter the Earth and its societies. Pruitt has recently introduced three talking points that researchers say grossly distort the latest climate science. They echo the types of claims made by skeptical researchers at conservative think tanks. Last week, Pruitt criticized scientists who warn of the risks associated with reaching a tipping point in global temperatures in an interview with Michael Barbaro of The New York Times. "I think it's pretty arrogant for people in 2018 to say, 'You know what, we know what the ideal surface temperature should be in the year 2100,'" Pruitt said. Scientists say the ideal surface temperature is what we are living with right now. There's evidence that the warming that has already occurred has altered some parts of the globe, most notably the Arctic, which has warmed twice as fast as elsewhere on the planet. Additional increases in temperatures could cause widespread disruption, according to researchers. It's misleading to say that the current rate of change is comparable to the past, said Kevin Trenberth, a meteorologist at the National Center for Atmospheric Research. He said the world is changing about 100 times faster than what would occur naturally, in terms of the long-term trends. Some trees and animals that have lived in the same region for centuries can no longer tolerate those places. Humans might have similar experiences, he said. In the past, change occurred over a long period of time, and species were able to adapt. That won't be true in the future if the rate of change continues or accelerates, as it is expected to do, Trenberth said. "The thing is most of those changes are occurring on time scales of 10,000 years, and you can sort of go with the flow; you can migrate and do various kinds of things related to that," he said. "When you really start crossing thresholds, and many of the species and plants that currently exist in various locations will no longer be able to exist in those locations anymore." Pruitt told a Nevada television station that humanity flourishes when the Earth is warmer. "We know that humans have most flourished during times of, what, warming trends," he said. Yet the warming globe is threatening island nations, some of which will have to be abandoned in the coming decades as the oceans rise. In some areas, sea levels could climb by a few feet, according to the most recent draft of the National Climate Assessment. Rising temperatures are also expected to cause a rise in deadly heat waves, the report found. "Daily extreme temperatures are projected to increase substantially in the contiguous United States," the report stated. That means daily temperatures could be 5 degrees Fahrenheit warmer by midcentury and 10 degrees warmer by 2100 in most areas of the United States, the report found. Meanwhile, the frequency and intensity of cold waves will decrease. Past civilizations have not thrived in those types of temperatures, because they pre-date human societies, said Allegra LeGrande, a paleoclimate researcher at the NASA Goddard Institute for Space Studies. "The warming that we're going into now, that is something that humans have not experienced," she said. "It's not like humans have thrived in previous warming periods; the warming we're talking about now was before human beings were human beings." To find a period that's analogous to today, you have to go back 125,000 years, LeGrande said. Ocean temperatures during that period were similar to what they are now, and climate change is expected to continue to warm the oceans, she said. Sea levels were about 30 feet higher, which would wipe out many of the world's largest cities. 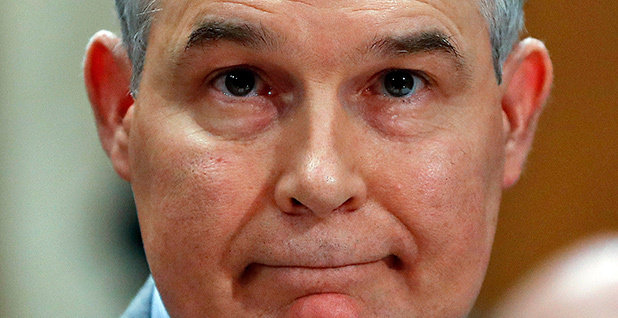 During a television interview with KSNV in Nevada on Tuesday, Pruitt questioned whether climate change could end the existance of humans, an extreme outcome that most researchers don't seek to explore. "Is it an existential threat, is it something that is unsustainable, or what kind of effect or harm is this going to have?" Pruitt asked. A study in September estimated that there's a 5 percent chance that warming could cause "catastrophic" impacts by 2050. The researchers said that under such a scenario, humans would have trouble adapting to things like worsening storms and the health effects of sudden changes to the climate. The paper, published in the journal Proceedings of the National Academy of Sciences, said it's possible that humans could be wiped out, but the chances are smaller than 5 percent. Pruitt also asked what kind of harm could be caused, short of extinction. Researchers point to damage that is already occuring. Sea-level rise and extreme rains have caused frequent flooding in some parts of the world. And droughts and higher temperatures have diminished water resources in others, according to the most recent report by the Intergovernmental Panel on Climate Change. In particular, climate change will hit poor people the hardest, it said. "Climate-change impacts are expected to exacerbate poverty in most developing countries and create new poverty pockets in countries with increasing inequality, in both developed and developing countries," the report stated. Human societies have developed during a remarkable period of climate stability, relative to the long-term paleoclimate record, said Kate Marvel, a physicist at Columbia University and a researcher at the Goddard Institute for Space Studies. The current rate of change is going to alter that, she said, by hitting some parts of Earth much harder than others. "What we're looking at now is a rate of change that is unprecedented in known history, and I think it's true that there might be winners and losers," she said. "We don't have the tools really to handle this." Those who don't accept established climate science often point to uncertainty as a reason to downplay concerns about climate change, Marvel said. That could leave humanity unprepared, she said. "A lot of times, people who are reluctant to accept the science of climate change flag up the uncertainty and kind of are comforted by it," she said. "I find the uncertainty the opposite of comforting, because if we knew exactly what to expect, we could plan for it. It's that we don't know what to expect that is terrifying for me."